Apollo 8 astronaut Frank Borman has donated his personal space artifacts to the Experimental Aircraft Association (EAA) for display in its aviation museum in Oshkosh, Wisconsin. 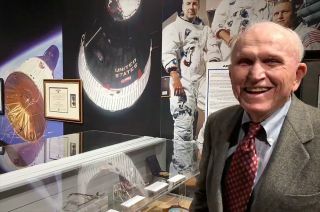 Frank Borman's personal space memorabilia has debuted on display, 50 years after some of the items accompanied him on the first mission to launch humans to the moon. "The Borman Collection: An EAA Member's Space Odyssey" opened at the EAA Aviation Museum in Oshkosh, Wisconsin, on Saturday (Dec. 8), showcasing the Apollo 8 astronaut's mementos. Borman joined Pelton for a ribbon-cutting ceremony on Friday, celebrating his donation and the items going on display. The museum's Borman Collection exhibit includes a portion of the more than 1,000 items that Borman donated to the EAA. "I have a long relation with the EAA and I believe this is the perfect place for them," said Borman. "The people who will see them are basically people who are interested in the history of aviation to begin with." A display case in the EAA Aviation Museum's new exhibit, "The Borman Collection: An EAA Member's Space Odyssey," includes artifacts Frank Borman used during his Gemini 7 and Apollo 8 missions. Borman, now 90, was selected with NASA's second group of astronauts in 1962. "You're pointing out to me how old I am," said Borman, reacting to photos of the first and second groups of astronauts on display in the exhibit. "These people [the Mercury 7astronauts] are all dead now. And here's the first 19, and I would say a majority of them are dead, too. This an era that has passed." The exhibit includes artifacts from both of Borman's space missions. On Gemini 7, Borman and astronaut Jim Lovell spent two weeks in Earth orbit in a spacecraft no larger than the front seats of a Volkswagen Beetle. "One of the things that NASA did for Gemini 7 was to design a lightweight suit so we could last 14 days in the Gemini spacecraft," said Borman, pointing to a helmet from that suit on display. "With spending 14 days with another human being in that kind of volume, you either turn out to be good friends or bitter enemies." "Fortunately, Lovell and I remain great friends," he said. The EAA exhibit also includes the small silk American flag and embroidered crew insignia that Borman wore on his spacesuit during the 1965 Gemini 7 mission and his PPK pouches from both that flight and his Apollo 8 journey to the moon with Lovell and Bill Anders three years later. "These were the bags we carried — our Personal Preference Kit they called them. We carried things like tokens of the flight for both Gemini and Apollo. Those were both on the spacecraft," described Borman. The exhibit also includes the translational hand controller used to manually fly the Apollo 8 command module. "This was a translator we used to control the spacecraft. You twisted it left, right, up, down, forward, back," Borman explained. "What you did was pulse it and once you pulsed it, it kept going. It wasn't like flying an airplane. There was no return to neutral. The way you stopped it was to pulse it in the other way." Other items on display include Borman's flown flashlight, the pencils he used to take notes, a mockup of the "eight ball," or flight director attitude indicator, used to determine the orientation of the command module and a pair of scissors used in the preparation of space food. Helmets worn by astronaut Frank Borman during his NASA career are on display in "The Borman Collection: An EAA Member's Space Odyssey" at the EAA Aviation Museum in Wisconsin. The walls of the Borman Collection exhibit are lined with photos documenting the astronaut's career as both a pilot and astronaut. While touring the room with EAA program coordinator Chris Henry, Borman paused to highlight one of the photos in particular. "That's Susan right there," he said, pointing to a photo of his wife of 68 years. "The best thing that ever happened to me was marrying her." Before joining NASA, Borman was medically grounded by the Air Force due to a broken eardrum and, after having his appeals rebuffed several times, he resigned himself to becoming an aeronautical engineer. Susan wouldn't hear of it. "She told me, 'You will not give up, that's your dream," said Borman, recalling how he followed his wife's advice and went to see the commander of the fighter squadron, who he flew with and had testify to get him reinstated. "I got back on flight status, but I was all ready to quit and I often admired Susan's courage and her dedication and love for me for insisting that I pursue a dream for what was a very dangerous profession." Borman also expressed his gratitude for the EAA Aviation Museum's presentation of his career. "I am grateful they have done such a good job and I am hopeful that it will help to inspire some young people to get into aviation," he said. "The exhibit is wonderful. It brings back a lot of memories." Watch astronaut Frank Borman tour the EAA Aviation Museum's new exhibit "The Borman Collection" at collectSPACE.